Can true love conquer all, even a centuries-old curse? Mia and Sawyer may be the first couple to find out. Mia is a strong, educated businesswoman with a horrible ex—-so horrible he’s in jail. Paul haunts Mia’s nightmares, but he’s back in LA and she’s in Lonesome Point, Texas living near her family and friends. Mia’s a bit of a prankster, and she topples into Sawyer mid-prank, very early one Saturday morning. Like 2:30am, after having far too many shots of whiskey. Sawyer isn’t looking for romance in Lonesome Point. He’s there to bid on the restoration of the nearby ghost town, but he’s more than happy to oblige the rambunctious redhead who stole his breath, okay knocked him breathless, in the street. Yeah, that Mia’s got spirit. Or, was filled with spirit… In either case, he’s intrigued enough to pursue her. Mia turns Sawyer away for two reasons: she’s still scared of intimacy after Paul’s abusive ways, and she’s sure the firstborn women of her family are cursed to lose their husbands on their wedding night. It seems a crazy curse, but Mia’s granny swears by it. She should know–her hubby died that way, too. It’s a fun, but not long, pursuit. All of Mia’s friends encourage her to leap–and Sawyer assures her everything will be casual. That’s before he gets her between the sheets however. Then it’s all Floodgates of the Past Confession Central and they spend a whole lotta time confiding in each other–excepting about Paul, he’s a taboo topic. Well, he’s taboo until he breaks parole. Can Mia survive Paul’s love? Can she give her heart to Sawyer, believing a curse might steal him away when they should be at their happiest? It’s a fun read with some interesting twists. I rather knew where the story was headed, but that’s likely equal parts good foreshadowing and attentive audience. The V-card issue was, perhaps, unnecessary. Lots of talk of unwedded parenthood, with the culture-clash in tiny Lonesome Point teetering on the disapproving side. For me, it seemed “meh.” I have no qualms about unwed parents. I do have trouble with deadbeat fathers–and this story seemed a bit littered with them. I’m glad Mia found the courage to love. I’m not glad that she kicked Sawyer aside out of fear. Or that she takes too much on herself. Made her seem a touch, um, naive, for me. That said, this is breezy read with a cool setting, fun characters and well-written smexytimes. I enjoyed it. Interested? 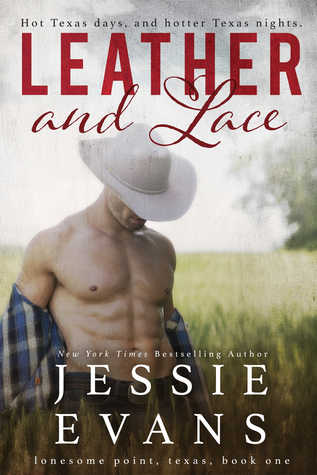 You can find LEATHER AND LACE on Goodreads, Amazon and Barnes & Noble. I received a review copy from the author in exchange for my honest review. Jessie Evans gave up a career as an international woman of mystery to write the sassy, Southern romances she always wanted to read. A southern girl, born and bred, Jessie loves writing Southern romances with just the right amount of sizzle, and hopes you’ll enjoy her stories set in the fictional town of Summerville, Georgia. Especially the “Always a Bridesmaid” series! You can catch up with Jessie online on Goodreads, her website, and twitter.